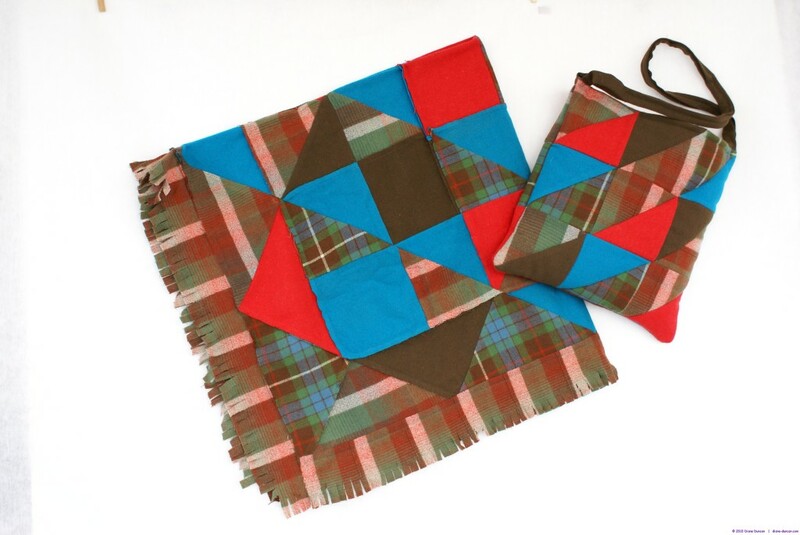 Home » Featured Flag » Rink Rug – Recycle a bin full of tartan skirts? Rink Rug – Recycle a bin full of tartan skirts? Somewhere on my art journey, I acquired a large plastic bin of tartan and wool skirts. A few were added from my personal collection over the years and I was/am challenged to figure out what to do with them – all that beautiful woolen fabric! I think that the bin probably dates back to my rug hooking days – they make beautiful variegated fabric when over dyed! Although I still have one mat/rug in the UFO bin, designed to match one of my quilts – and I will finish it one of these days – I don’t think the content of the bin will find it’s way in it’s entirety into hooked items. I no longer know anyone who is doing rug hooking and my interest has waned! This set, consisting of a lap rug and carrying bag, padded for double duty as a seat pillow, was one of the projects that I envisioned to recycle this fabric. The lap rug was inspired by the raw-edged quilts that were popular a few years ago. Only this time, some of the raw edges go to one side of the rug, some to the other and are not deeply clipped. I added a fringe with deep clips to finish it off. Because the fabrics are tightly woven and were washed in hot water to do some ‘fulling’ the seams didn’t need a lot of clipping. The carrying bag, from the same fabrics is made from two layers of woolen fabric and two layers of quilt bat (using up my odd pieces). The outside is pieced (no raw edges) but the inside is one piece of fabric from one of the pieced fabrics. As a cushion, four layers of woolen fabric and four layers of quilt bat help to keep the bum warm while watching a hockey game or other sporting event!